I guest lectured yesterday afternoon in an Introduction to Public History class about the technical, or systems, side of working with digital history. Shortly after starting the new job, I started chatting informally with with one of my faculty colleagues, Dr. Ray Rast — Assistant Professor of History at Cal State Fullerton and an Associate Director for our Center for Oral and Public History — about ideas for incorporating more emerging technologies into the discipline of public history, as well as ideas for better equipping public history students with technical skills that make them more marketable. Dr. Rast asked if I would consider guest lecturing in his public history class during the fall semester, to talk about my career path (classes, degrees, jobs, skills, etc.). Although I don’t work in an official public history capacity, Ray thought that the type of technical skills and experiences I have amassed throughout my career as a librarian and web developer, particularly on projects and systems that contribute to public history, would be helpful for his students to hear. Those students who pursue work in the field of digital history will definitely need to be aware of, and in many cases become familiar or proficient with, these skills. And even those students who pursue more traditional history-related careers will most likely have to work with using or implementing at least a few of these technologies. What exactly is digital history? I set out trying to wrap myself around the concept of “digital history”. That term didn’t exist back when I studied public history almost a decade ago. 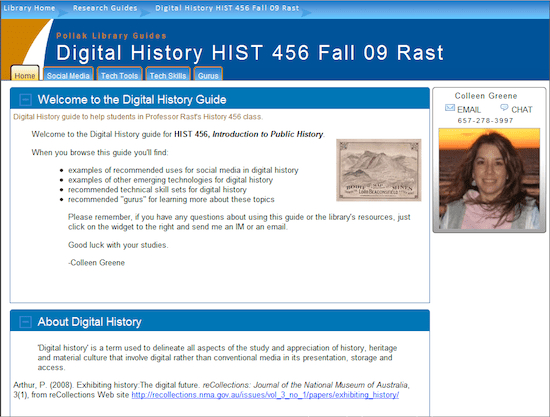 Dr. Rast steered me towards George Mason University’s Center for History and New Media (CHNM) as a good example of an academic institution that teaches digital history. He also recommended I read “Digital History: A Guide to Gathering, Preserving, and Presenting the Past on the Web“, an invaluable guide — which I am still reading — by CHNM’s Daniel Cohen and Roy Rosenzweig. ‘Digital history’ is a term used to delineate all aspects of the study and appreciation of history, heritage and material culture that involve digital rather than conventional media in its presentation, storage and access. What tech skills should digital historians possess? Trying to relate my technical skill set and work, as well as a recommending an actual technical skill set, to an introductory class is no easy task. If I were talking to programmers, librarians, or social media marketers, I could make specific recommendations tailored to each group. But, these were students just beginning to explore the discipline of public history, and from varying technical expertise and interest. Those who end up working for an archive, museum, or agency that does not have programmers on staff, or available through a parent organization (such as a campus or municipal government), are going to have to understand the basics of open source programming environments (such as as a LAMP, as opposed to a .NET, environment). While these students might not do the actual programming, they are going to have to at least know how to communicate about these technologies with hosted solutions, parent agencies, or in-house staff. Both the techies who want to build digital history tools, as well as those who will have to make decisions about adopting and implementing these tools, need to understand concepts such as XML and APIs, which allow different systems to talk to each other and exchange data. They will need to have a grasp on how to use free social media tools to promote their organization’s services and collections, store and re-purpose content (particularly photo and video collections), and engage and interact with patrons. They should know and follow the “gurus” in their field, so that they can continue to stay abreast of applicable emerging technologies. That is a lot to throw at them. I knew it going into the class, and I sensed it coming out of the class. But, I felt obligated to touch on those topics because these are skills that will definitely make these students much more marketable in public history careers. Fortunately, I did witness quite a bit of physical confirmation that I was connecting with the students, making some sense (whew! ), and shedding light on a new side to public history. I even had a few come up afterwards expressing interest in pursuing internships in this area. My Digital History Tools guide. To help them out, I have started developing a library guide for this class, filled with examples, suggestions, and resources to learn more. I am still adding content to the guide, so did suggest that they bookmark it and check back through the semester. When talking to my husband last night about my reasoning for broaching such a technical topic, he quickly wittingly replied that, “Just because we study and teach history doesn’t mean we have to be stuck with ancient technologies”. If you’re trying to access my research guide via Internet Explorer or Google Chrome, I am aware the guide is bombing out with a server error. It works just fine in Firefox (no surprise there), but I have our lead programmer looking into the problem. The server error problem on the guide has been fixed. I mistakenly pointed to our development server, instead of our production server, which was looking for a missing cookie since we normally are logged into our content system when working off the development server. Our super star programmer fixed the problem.